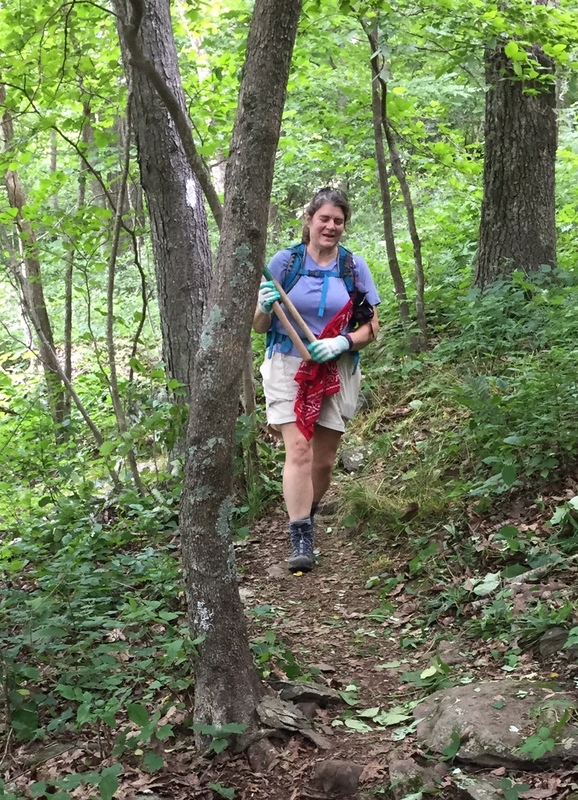 Hike leader Barbara Martin was joined by ten fearless hikers to brave Ramsey's Draft Wilderness. Andre Meyer, John Brandt, Nancy Handley, David Crowe, Claire Cline, Marian Styles, John Shannon, Dennis Templeton, Andrea Collins and Michael Seth started from Mountain House parking area to hike a loop up the Ramseys Draft Trail to Jerry's Run Trail, south on the Shenandoah Mountain Trail and back to our cars on the Road Hollow Trail. At the first of five stream crossings we lost the trail, but with the help of John Shannon with his GPS we found the trail and successfully forded the next four stream crossings to find Jerry's Run Trail. Vegetation including brambles and nettles were plenty, but so were wild flowers and a sense of adventure found only on an unblazed trail in a wilderness area. With clippers in hand we found our way along the beautiful Jerry's Run trail to our lunch spot at the old Sexton Cabin. The clearing was most welcome after the abundance of vegetation along the trail. After lunch we once again lost the trail, only to find it again with the help of John Shannon's GPS and shortly after reached the beautiful Shenandoah Mountain Trail. We followed this for a mile or so reaching the Road Hollow Trail and back to our cars. We were blessed with a beautiful day, blue skies and escaped the forecast of afternoon thunderstorms. Who could ask for more? Lori and Darrell Doughty met hike leader Michael Seth at the former Massanutten Visitor’s Center on 211. Barbara Martin arrive a bit late just after the three had left the parking lot so missed the hike. The weather was near perfect, sunny temperatures in the 70s with gentle breezes and very little humidity. We hiked at a fairly brisk pace starting at 9:40 and finishing the 12 mile hike a little after 3:00. We took a brief look at Emerald Pond which really was emerald-colored. We didn’t jump in as planned partly because the weather was not. We skipped the sunny path with the giant anthills and hiked along the cliffs. Exceptionally clear air gave us great views to the West from Big Schloss to the north to Elliot Knob in the south, and distant peaks in West Virginia. people join me to cut back summer growth. Most people went to the Crozet Tunnel walk in the morning, so we started later than normal. At the entrance station, the friendly rangers waved us in when we said we had come for trail maintenance. We collected two weedeaters from the toolbox, one for me and one for Dave Borzich. At our McCormick Gap starting point, we saw District Manager Don White, who was meeting a new overseer. The steep ascent to the AT required little clearing because Marian Styles had cleared much of the growth two weeks earlier with a swing blade while I pulled some garlic mustard. While Dave and I fired up the string trimmers and set forth, Jeanne Siler, CJ Woodburn, David Crowe, and Marian followed with clippers. 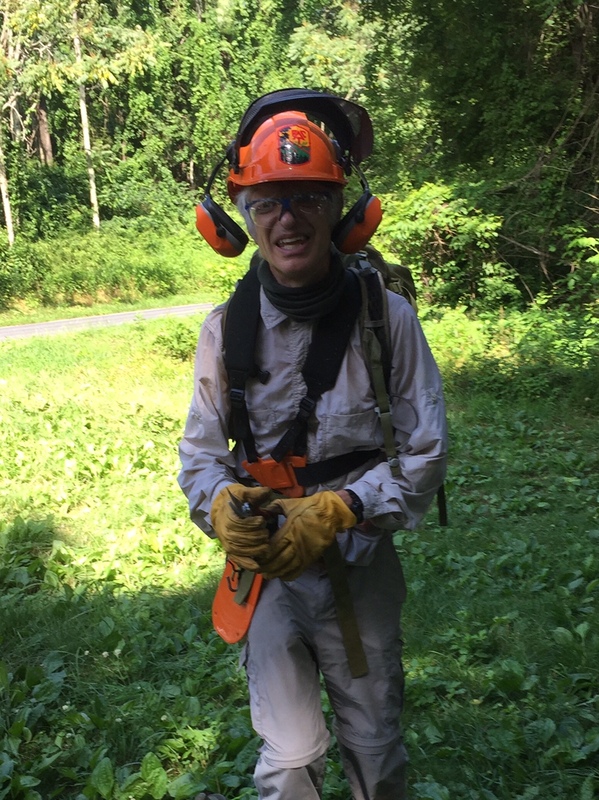 They cut shrubs too thick for a string trimmer as well as the many small branches growing into the trail corridor. We stopped for a lunch at a rocky outcropping, where we had a partial view of Waynesboro. After our break and a bit more clearing, we walked back to our cars. During our outing we met several backpackers, some of whom were heading to Mt. Katahadin. Most of them thanked us for keeping the AT in good shape for hiking.